Mail order pharmacies in Alabama? Effective June 9th, 2014, all new applicants for an Alabama Mail Order Pharmacy Permit must have an Alabama licensed Pharmacist in Charge (PIC). All currently licensed Mail Order Pharmacies must have an Alabama licensed PIC by December 31st, 2014. This date coincides with the AL biennial license renewal deadline and the license will not be renewed unless the pharmacy has a PIC licensed in AL. Per Code of Alabama (1975) Section 4l-22-6, rule 680-X-2-.07, all Mail Order Pharmacy Permit holders must "designate a supervising pharmacist who shall be licensed by the Alabama State Board of Pharmacy. The supervising pharmacist shall be responsible for ensuring that the holder of the permit referenced herein complies with the requirements of this rule and all applicable statutory provisions and rules." To obtain a license as a Pharmacist in Alabama, all applicants must request the license through NABP, prepare an official application for the Alabama Board of Pharmacy, and pass the Multistate Pharmacy Jurisprudence Examination (MPJE). The Alabama licensed PIC does not need to be the same PIC of the home state of the pharmacy. All other pharmacists working under the PIC simply need a valid pharmacist license in the state where the pharmacy is located. 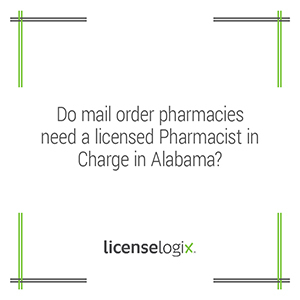 LicenseLogix will begin the Alabama Pharmacist licensing process TODAY. Don't wait another minute! To get started, click here and enter your contact information.